Care2.org, a popular online destination for people who care about making a difference is sponsoring a "Love Your Market" contest in collaboration with LocalHarvest.org, a web site all about organic and local food. As you know, University Heights has its own market, called the University Community Farmers Market. It is held on the South Campus has been entered in the "Love Your Market" contest and is eligible to win money to support it. An important feature in the University Heights neighborhood, the market started in 2007 and is a great way to get healthy local products, support local businesses and meet your neighbors. It runs every Saturday through October 17th from 8:00am - 1:00pm on the UB South Campus on Main Street at Kenmore Avenue. Read about the market on LocalHarvest. 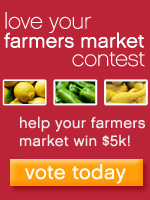 Please vote in the "Love Your Market" contest today, and tell others to vote as well. We appreciate your support! Click here to vote. For more information about the University Community Farmers Market contact UB Community Relations at 829-3099.